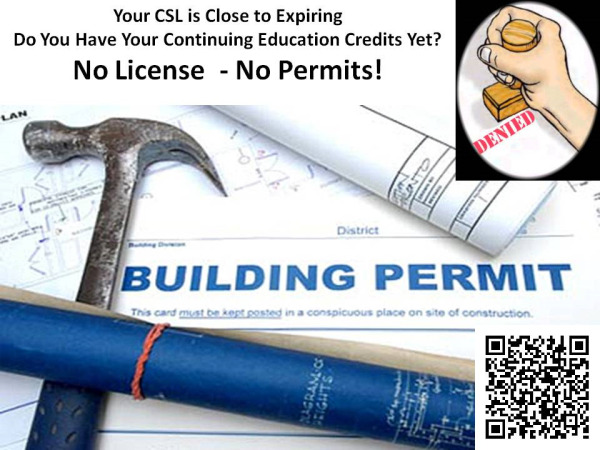 Last minute Mass contractors have been calling to get their CEU's (continuing education credits) before their CSL (Construction Supervisor License) expires. One contractor is concerned he will not be able to pull permits if he doesn't pick up his credits. He is justified to worry because some building inspectors told us at the May EMNARI dinner meeting they need to see a current license to give a permit. This means some contractors who need Continuing Education Credits after July 1st to renew their license may have to pass on some projects. Ouch!